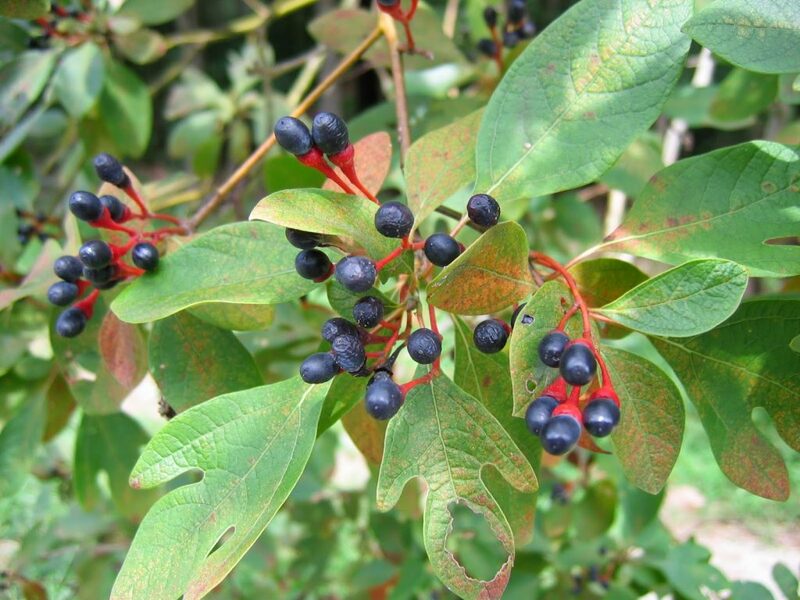 Sassafras albidum. By Alexey Zinovjev. Copyright © 2017. Salicicola.www.salicicola.com (Accessed 2/2017). 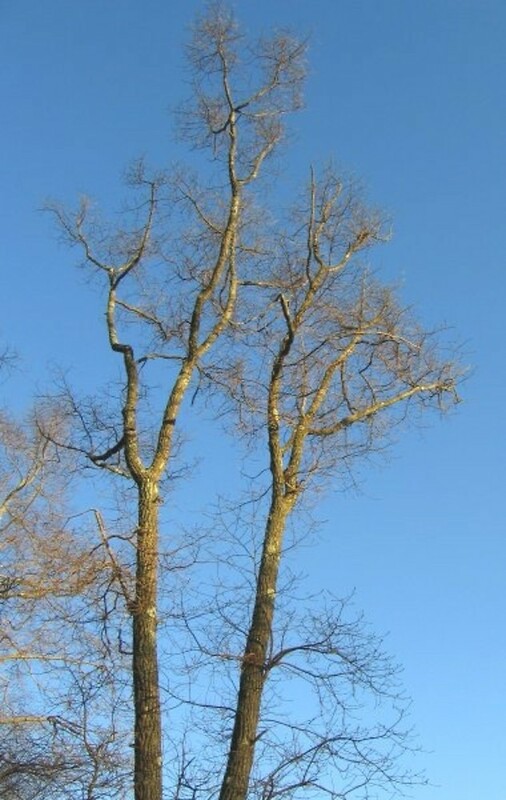 Sassafras albidum is a tree to 30 m tall (usually smaller), 20 cm dbh. Shallow rooted with extensive lateral roots. Most parts pleasantly aromatic. Colonial from root sprouts, forming dense stands; habit pagoda-like; trunk and branches sinuous; twigs pale green, spicy smelling, curving upward; older bark dark brown, deeply furrowed; winter buds irregularly elliptic, scales overlapping (Harlow 1946). Leaves alternate, egg-shaped with 0-3 rounded lobes, typically 2-lobed, mitten-shaped, asymmetrical; leaves expand mid-May; winter plant leafless 160 days (Britton 1874). 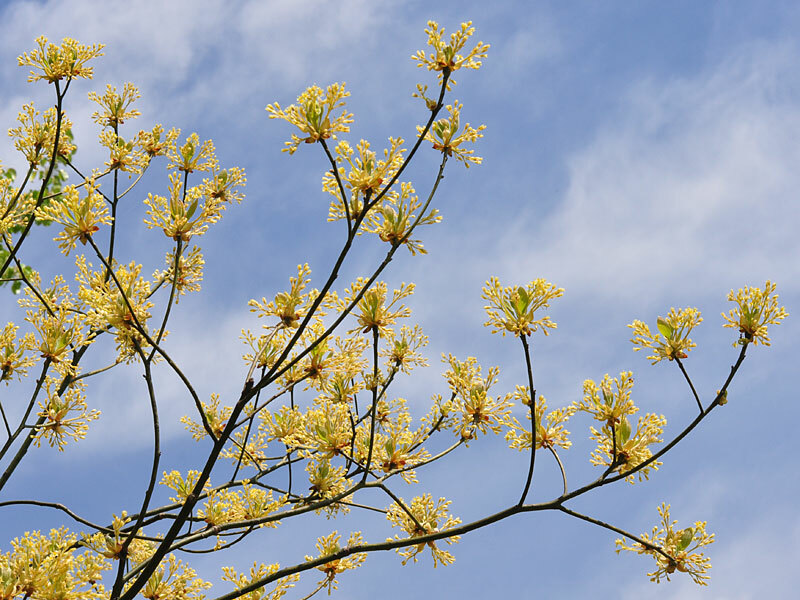 Sassafras albidum in bloom.Copyright David G. Smith.Delaware Wildflowers.delawarewildflowers.org (Accessed 2/2017). Flowers dioecious, green, small, at branch tips, before leaves expand; blooms late April-early May. Fruit fleshy, blue-black, 1cm, 1-seeded, stem red, expanded; Aug.-Sept. Seed load 34%. Fruit pulp nutrients: water 52%, lipid 54%, protein 5%, CHO 6% (White 1989). Seeds dispersed by birds and small mammals, viable in seed bank to 6 years. Fruit high in lipids, eaten by fall migrant birds (Martin et al., 1951). Habitat: Disturbed woodlands, open areas, edges. Often colonizing burned areas on bare, mineral soil. Tolerate soil pH 3.8-7.3 (Greller et al. 1990; Hightshoe 1988; USDA, NRCS 2010). Clones may form closed canopy when mature. Intolerant of flooding, salt. Dies out under deep shade but reported to be more shade tolerant than maple or red oak, (P50 of 600 foot candles) (Bazzaz et al. 1972). However, Hightshoe (1988) lists Sassafras as intolerant of shade, index 2-4 (red oak listed as moderately tolerant, index 7.8). Needs more than 1% full sun to grow (compensation point) but can use only 30% full sunlight (saturation point (Hicks and Chabot 1985). Saplings, seedlings and root sprouts common in second growth forest understory, but appear not to survive long (Gargiullo personal observation). Allelopathic chemicals retard invasion of clonal stands by other vegetation. 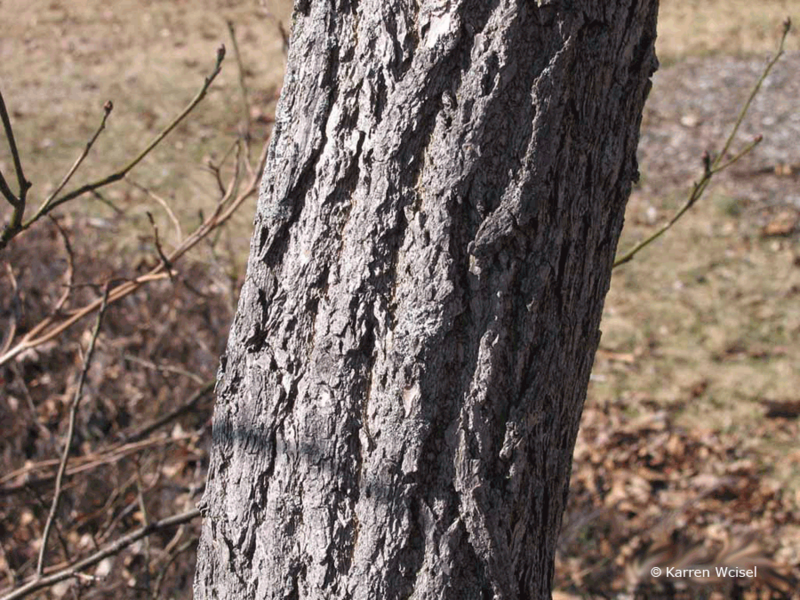 Sassafras albidum.bark.© Karren Wcisel.treetopics.com (Accessed 2/2017). 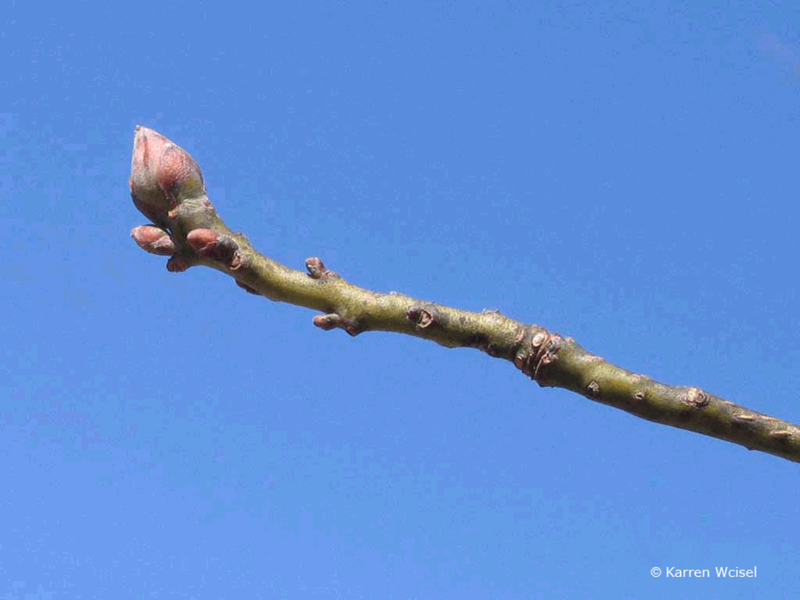 Sassafras albidum winter bud.© Karren Wcisel.treetopics.com (Accessed 2/2017). Notes: Twigs eaten by rabbits and deer (Martin et al., 1951). Very susceptible to fire but able to root sprout after light burns. Attacked and often killed by larvae of a wood boring beetle (Apteromechus ferratus). Foliage eaten by gypsy moth larvae (Lymantria dispar). Larvae of the spicebush swallowtail butterfly, Papilio trolius (Lepidoptera) also eat sassafras (Opler 1992;Tallamy 2003). A favorite host of Japanese beetles (Popillia japonica). The sassafras weevil, Odontopus calceatus (Curculionidae, snout beetles) feeds on buds and leaves in the spring and early summer. The larvae is a leaf miner (Burns and Honkala 1990; Johnson and Lyon 1991; White 1983). Occasionally infected by various fungal diseases including anthracnose die back caused by Glomerella cingulata (Ascomycotina). The reproductive state of this disease is called Colletotrichum gloeosporioides, characterized by masses of pinkish eruptions or dark blisters, to 0.5 cm wide, on dead stem or leaf tissue. Botryosphaeria obtusa (Ascomycotina), causes die back of stressed trees. Ganoderma lucidum (Basidiomycotina) is a root pathogen. The reproductive structure is a red-brown bracket fungus with a shiny surface, often near the base of the tree. Nectria galligena (Ascomycotina) cankers begin as small dark depressed areas on young bark. As the canker progresses it developes a target-like appearance as successive layers of callus tissue are killed and die back. Eventually it girdles and kills branches (Agrios 1988; Sinclair et al. 1987).